Former Miss Universe Olivia Culpo recently spotted in a white bikini at Miami looked super happy after getting back together with ex-boyfriend Danny Amendola. 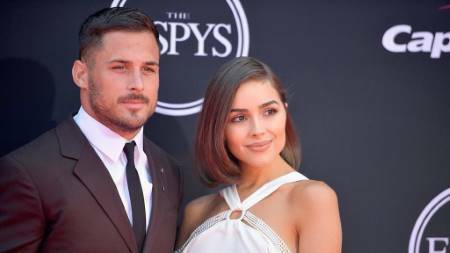 It appears that American Model and actress Olivia Culpo reunited back together with ex-boyfriend Danny Amendola. However, the couple made no official announcement confirming the rumors yet. But, following the recent activity of the two, the evidence to their reunion speculation is pretty much strong. The 26 years old former Miss Universe currently on a holiday with her friends in Miami beach looks really happy on her recent Instagram posts. And this is most likely because she patched up with ex-boyfriend Danny Amendola. In one of her Instagram posts, Culpo is seen in a two-piece bikini with all smile on her face, as she stands on the jet ski ride throwing her hands in a peace sign. Other than that, the gorgeous model can be seen wearing sunglasses and a blue life-saving jacket. The model captioned the picture simply with a blue emoji. As a matter of fact, the picture surpassed over 108k likes so far. Moving onto her rumored reunion with footballer boyfriend, both Olivia and Danny posted similar footage of their new year celebration. Basically, as per what we noticed, both the couple posted same fireworks picture, just in different angles. However, this is not the first time the couple broke up and reconciled their relationship again. Olivia and her boyfriend started dating in 2016, broke up last year and got back again last summer. The couple broke off their relationship again a few months back when the media spotted Amendola with a strange woman in the beach. Nevertheless, as per several sources, the gorgeous couple is focusing to work on their relationship again.